Created in 1920 by Bernard, Bernard Motors whose main business was the manufacture of industrial and agricultural engines. They quickly gained a strong reputation for robust and high quality engines that where adopted by larger concerns looking for a high quality engine. In 1924 they formed an association with “Guinard”,a manufacturer of pumps. In 1929 they squired C L Conord. In 1934 Auguste Bernard sadly died, and his brother Frédêric took control as president with the support of Auguste son Jacques as a main board director. In 1941 Bernard Motors re purchased the thermal engines department from Ets. Japy Frères. 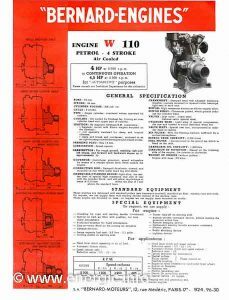 In 1947 they produced there first air cooled light alloy engine, the W10. This was followed by many successful derivatives of this ally air cooled engine which powered the Energic motoculteurs of the mid 1950’s on wards. Notably the W110 (1951), W39 (1958), W139 (1961), and so on. They where sold to the manufacturing giant Renault in the early seventies (1972) and then de merged later. Today Bernard Motors is the only French manufacturer capable of supplying, in its category, thermal engines and specific groups intended for Industry, Building, Agriculture, Civil Protection. 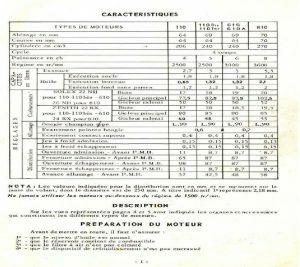 Bernard W19, W39, W139, W239, 110, 110BIS, W610 and W810 are all used within the Energic Motoculteur ranges at different times in the post war period. Engine. Bernard W19, 4 stroke. 3.0cv, Cylinder 143cm3, alésage 56 x course 58. Engine types; W19 = 3cv, W39 = 3,5cv, W139 = 4cv, W 239 = 4.5cv, 110 = 4cv, 110 BIS = 5cv, W610 = 6cv et W810 8cv. Dates available; W19 sorti en 1955, W39 en 1958, W139 en 1961, W239 en 1962. 110 en 1951, 110 BIS en 1959, W610 en 1959 et W810 en 1963. Such as Series motoculteur 120 type 123 3.5cv uses a moteur Bernard W39. Such as Series motoculteur 110 type 114 4cv uses a moteur Bernard W139 and type 115 5cv uses a moteur Bernard W239. 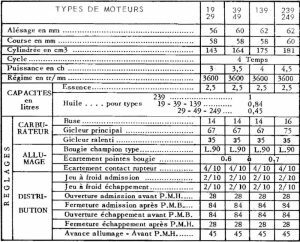 Energic motoculteur typical specification sheet for Bernard moteurs. Energic motoculteur Bernard moteurs W810 8cv. Energic motoculteur 214 Bernard moteurs w 110 4cv. 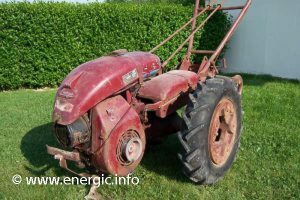 Energic motoculteur 215 Bernard moteurs 110 BIS 5cv. 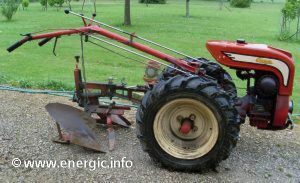 Read more about Energic Motoculteur 114 with Bernard W39 engine/moteur here. 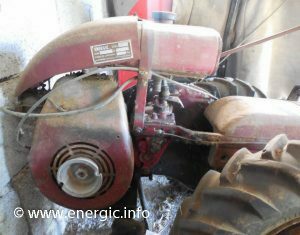 Read more about Energic Motoculteur 125 with Bernard W239 A engine/moteur here. 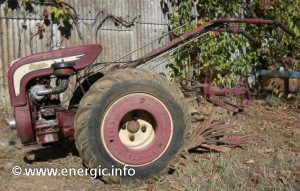 Read more about Energic Motoculteur 205 with Bernard W110 BIS engine/moteur here. 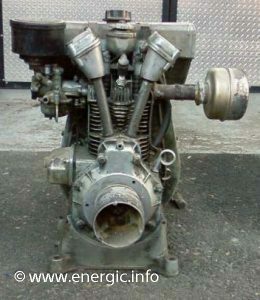 Read more about Energic Motoculteur 226 with Bernard W610 engine/moteur here. Read more about Energic Motoculteur 218 with Bernard W810 engine/moteur here.